If possible, I would like to replace the two LEDs with a single, 2-pin, bicolor LED (in effect, 2 LEDs connected in reverse parallel). 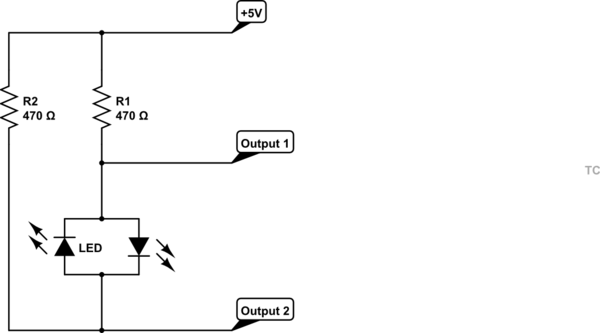 The new circuit would behave as follows: when neither of the circuit's output pins are grounded, no power is supplied to the LED; when one of the pins is grounded, power is supplied to the LED with polarity oriented one way or the other, depending on which output pin is grounded. The power source is a battery whose voltage will range from 11V to 13.6V. Additional requirement: Relays are not an option. In its default configuration (using internal LEDs), the circuit's current consumption is advertised as 0.125mA. If a solution that keeps power consumption similarly low isn't possible, I'll stay with two external LEDs, or I'll go with the internal LEDs and a light pipe if possible. As the enclosure might need to be opened by the user, an electrical connection to a panel LED is preferable. Also, zero (or as close to zero as possible) RF and conducted noise is a requirement. Related threads: I think the answer in this thread might come close to what I need. If this solution could meet my requirements, I would need help with how to adapt it for two inputs and to allow both LEDs to be off. Answers in this thread also seem applicable, but again, I would need help in adapting a solution to my needs. This one contains a number of interesting solutions, but again, one logical input, not two. You'll get some wasted power as one of the resistors will be pulled straight to ground when an LED is turned on, however if you go for a low-current LED, you can increase the resistance to reduce the amount of wasted current. Alternatively, the simplest option would be to use a common-anode 3-pin bi-colour LED. This would then be wired up exactly as the diagram in your post, with the common anode via resistor to +5V, and the two cathodes to your outputs. Not the answer you're looking for? Browse other questions tagged led parallel reverse-polarity reverse or ask your own question. How do I design a circuit to replace two LEDs (which illuminate alternately) with one bicolor LED? Can two LED circuits with a shared ground use a single resistor?